Good news Patrick! The very popular animated series, SpongeBob SquarePants, has been picked up for another season of 26 installments. SpongeBob SquarePants follows the adventures of a good-natured sponge (Tom Kenny) and his friends who live in the undersea community of Bikini Bottom. The show also features the voices of Bill Fagerbakke, Rodger Bumpass, Carolyn Lawrence, Clancy Brown, Lori Alan, Mary Jo Catlett, Doug Lawrence, and Dee Bradley Baker. 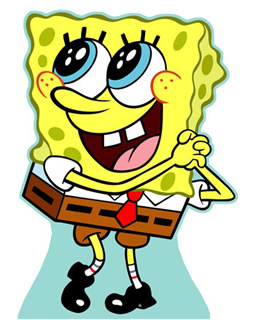 Having recently celebrated its 10th anniversary, SpongeBob continues to be one of the most popular shows in kids television, is seen in 171 markets, and is translated into 26 languages. It’s reportedly the most widely-distributed property in the history of the MTV Networks. In addition to being very popular with kids ages 2-11, adults and teens also make up a large percentage of the show’s audience. The newest round of installments will bring the show’s episode count to 178 and will see SpongeBob and his pals through the 2010-11 season. What do you think? Have you ever watched SpongeBob SquarePants? If so, how do you think it compares with other animated kids shows? Should it continue or would you cancel it? More about: SpongeBob SquarePants, SpongeBob SquarePants: canceled or renewed? Please Let SpongeBob air it’s for kids come on guy don’t do it. I cant believe you are blaming a cartoon for someones actions. That is insane. Its called parental responsibility. If kids are picking up behaviors from TV shows, then lets see, the parent changes the channel or turns off the TV instead of using it to raise their kids for them. Spongebob isn’t a role model because he’s just a CARTOON, to ENTERTAIN kids not to EDUCATE them. The role model of your cousins shouldn’t even be a cartoon, it should be their parents so shut the freak up ’cause you seriously don’t make sense. By 2011.. ALL THE 90’S ARE CANCELED BY NOW PEOPLE WHO LIVE IN LATIN AMERICA OR CARRIBEAN ASK NICKELODEON TO MAKE SLIMEDEON WITH 90’S CARTOONS FOR HOURS WITH NO 2000’S CARTOONS NICKELODEON IS PURE EVIL LIKE DISNEY AND CN! Dude,SpongeBob is my favorite show in THE world! So yeah its also my favorite show on nick!!!!!!!!!!!!!!!!!!!!!!!!!!!!! maybe its my maturity, but spongebob used to be littered with jokes that children will enjoy, and hidden jokes that adults will find amusing (political, life, etc. ), but the new ones are filled with all of those jokes little kids find and nothing older people enjoy. They are all about farts, burps, and being naked. They should 100% Continue SpongeBob (and the other Nicktoons). The New Shows coming are not as funny! I love spongebob. I have watched it for years and compared to that hana montana crap, Spongebob is the best thing on nick for the part 11 years. SpongeBob I have been watching since is came over a decade ago in 1999. I even still watch it almost everyday, it is for all ages not just for kids, everyone can enjoy this awesome show. I hope that this show will keep going on for a long while? Sponge bob is sometime twisted and he does some guy things that should be shown to the kids like when the first movie he made and at the end Patrick wore woman high heels now that is sick.We need to get back to basic when we were growing up.And who to say they won’t like show like You can’t do that on Television and Salute your Shorts they are classic.I understand you this company love rating but at the same time let keep our morals and protect our kids from filth. but you watch the simpsons for 20 some odd years right? i think that animated serieses is not only aimed at kids .. I cannot stand Spongebob. The innuendo is ridiculous and the character seems to cross the line too often. “Bikini Bottom” and “Sandy Cheeks” isn’t funny when it’s a show aimed at kids. I think you’re taking it a little to literally. Its a show meant for kids. Kids aren’t going to read into that. I didn’t even read into that until you said something. Seriously, It’s aimed toward kids. It’s not meant to be a perverted thing like you make it out to be.